Home Church Blog Elders Thoughts Why Jesus? Last week I had a cold caller arrive at my front door trying to persuade me to switch from my existing electricity provider to his company. He promised to slash my monthly bills and assured me they were the cheapest around. I politely asked for some literature so I could think it over, said goodbye and quickly closed the door. The leaflet was thrown onto a pile of similar leaflets that maybe one day I might be bothered to read. Two days later I answered my front door to another cold caller who represented a different electricity provider. He promised me he could slash my monthly bills and assured me they were the cheapest around. Again I repeated my actions. It all sounded rather familiar. The problem with these companies is that they all make the same claims but they can’t all be telling the truth. So I gather up the leaflets but don’t do anything with them. However, deep down I know that I’m probably paying too much for my electricity. What I really need to do is take the time to see if I could be saving money. I know I should do this, but life is busy and it’s just never been a priority. Many people have the same attitude when it comes to spiritual matters. We have heard different claims from different groups and we don’t know who, if any, are telling the truth. Christians make big claims about Jesus Christ. The reason they do this is because he made big claims about himself. In John 14:6 we read that Jesus said, ‘I am the way, and the truth and the life. No one comes to the Father except through me.’ In other words, the only way to get to God the Father is through Jesus Christ. Is this true or was it just another sales pitch from somebody looking for followers? Can the words of Jesus really be trusted? Sadly, when it comes to spiritual matters, many people are like me with electricity suppliers. We realise there might be something in it, but we’re just not bothered enough to do anything with what we have heard. But if a different company can save me money I would be foolish to ignore what they have told me. In a greater way, if what the Bible teaches us about Jesus is true, it would be a tragedy to ignore him. 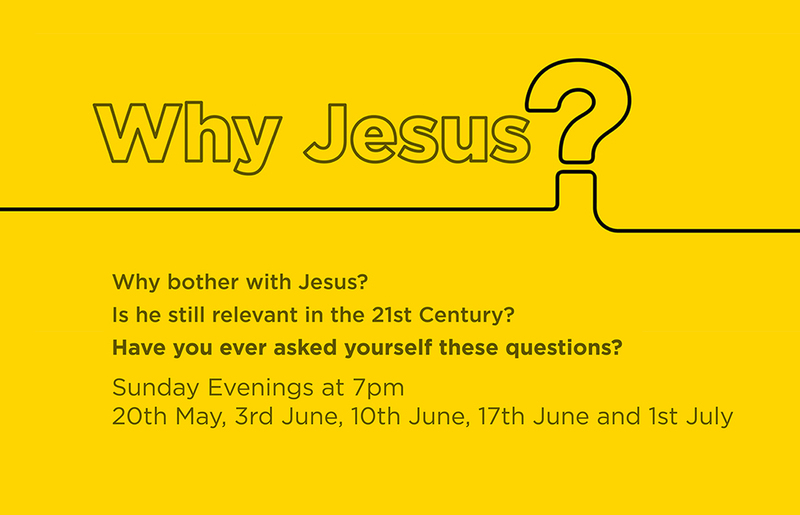 For five Sunday evenings, we will be running a series of events called ‘Why Jesus?’ .We want to consider whether Jesus is somebody to be ignored and rejected or trusted and followed. These informal evenings will be held in Carrickfergus Baptist at 7pm on 20th May, 3rd June, 10th June, 17th June and 1st July. Perhaps you have been putting off thinking about spiritual issues. Maybe it’s time you considered ‘Why Jesus?’ and whether there really is something to the claims of the Bible.